The 2020 edition of the European Entrepreneurial Region (EER) Award has been launched. 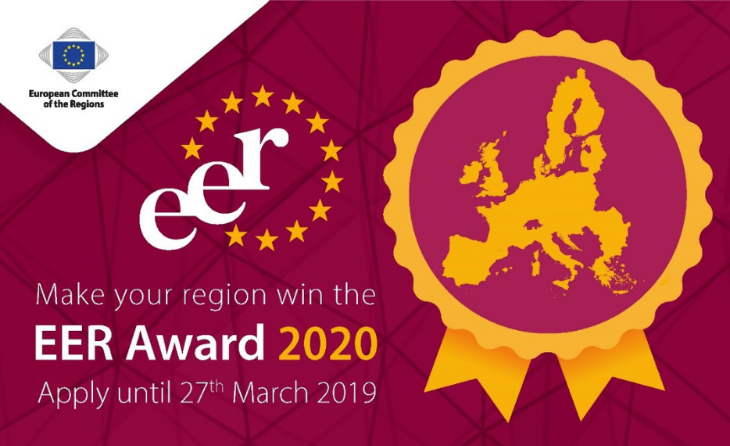 The EER award is open to all EU regions and cities that are ready to implement an ambitious strategy to support their SMEs and entrepreneurs. Each year, the EER label is awarded to three EU territories with an outstanding, future-oriented strategy to promote entrepreneurship and support small and medium-sized enterprises in their territories. All EU regions, cities or any other local or regional institution with the political competence to implement an entrepreneurial vision are invited to hand in their application, irrespective of their size or wealth. The EER gives recognition and visibility to your entrepreneurial strategy and concrete projects. It helps you reach out to your entrepreneurial ecosystem’s stakeholders and give a boost to the ecosystem’s maturation. It provides you with access to a network of potential partners for cooperation initiatives. The deadline for the submission of applications is 27 March 2019. The application form and detailed information about the assessment criteria are available here and on the flyer here. Regions and cities that are ready to implement a future-oriented entrepreneurial strategy are invited to apply by e-mail to eer-cdr@cor.europa.eu.